When you connect a microcontroller to a sensor, display, or other module, do you ever think about how the two devices talk to each other? What exactly are they saying? How are they able to understand each other? Communication between electronic devices is like communication between humans. Both sides need to speak the same language. In electronics, these languages are called communication protocols. Luckily for us, there are only a few communication protocols we need to know when building most DIY electronics projects. In this series of articles, we will discuss the basics of the three most common protocols: Serial Peripheral Interface (SPI), Inter-Integrated Circuit (I2C), and Universal Asynchronous Receiver/Transmitter (UART) driven communication. First, we’ll begin with some basic concepts about electronic communication, then explain in detail how SPI works. 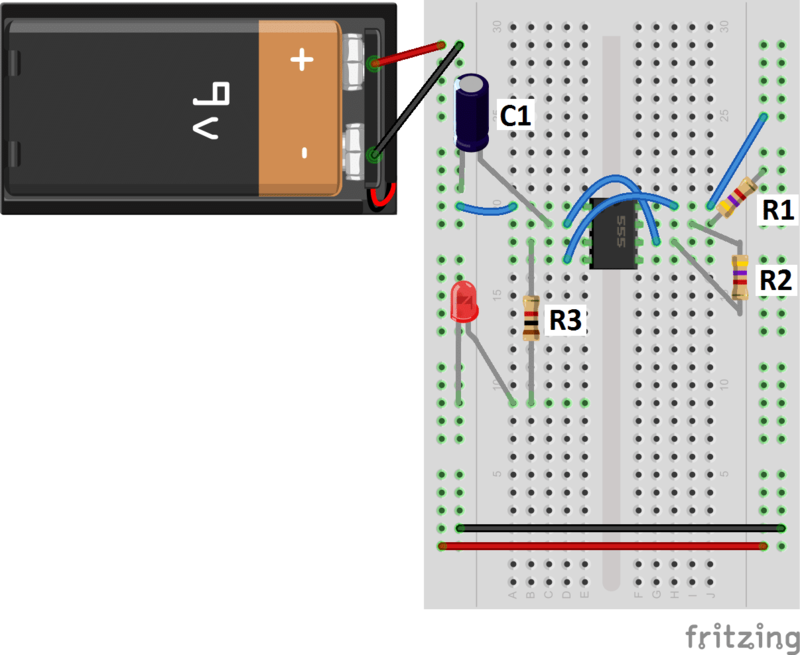 In the next article, we’ll discuss UART driven communication, and in the third article, we’ll dive into I2C. SPI, I2C, and UART are quite a bit slower than protocols like USB, ethernet, Bluetooth, and WiFi, but they’re a lot more simple and use less hardware and system resources. SPI, I2C, and UART are ideal for communication between microcontrollers and between microcontrollers and sensors where large amounts of high speed data don’t need to be transferred. Electronic devices talk to each other by sending bits of data through wires physically connected between devices. A bit is like a letter in a word, except instead of the 26 letters (in the English alphabet), a bit is binary and can only be a 1 or 0. 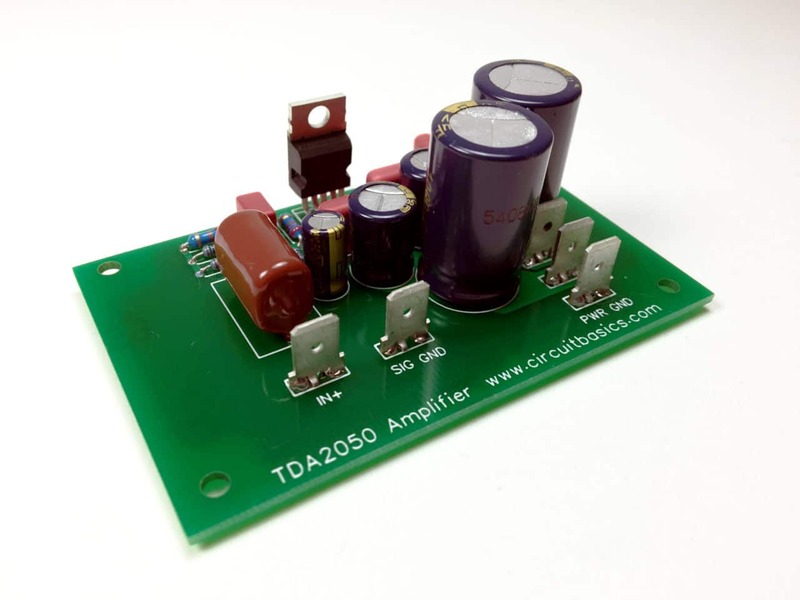 Bits are transferred from one device to another by quick changes in voltage. In a system operating at 5 V, a 0 bit is communicated as a short pulse of 0 V, and a 1 bit is communicated by a short pulse of 5 V.
SPI is a common communication protocol used by many different devices. For example, SD card modules, RFID card reader modules, and 2.4 GHz wireless transmitter/receivers all use SPI to communicate with microcontrollers. One unique benefit of SPI is the fact that data can be transferred without interruption. Any number of bits can be sent or received in a continuous stream. With I2C and UART, data is sent in packets, limited to a specific number of bits. Start and stop conditions define the beginning and end of each packet, so the data is interrupted during transmission. Devices communicating via SPI are in a master-slave relationship. The master is the controlling device (usually a microcontroller), while the slave (usually a sensor, display, or memory chip) takes instruction from the master. 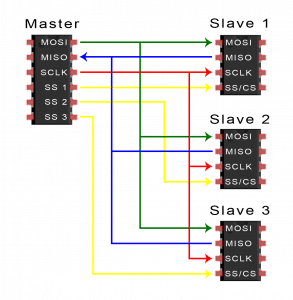 The simplest configuration of SPI is a single master, single slave system, but one master can control more than one slave (more on this below). MOSI (Master Output/Slave Input) – Line for the master to send data to the slave. MISO (Master Input/Slave Output) – Line for the slave to send data to the master. SCLK (Clock) – Line for the clock signal. SS/CS (Slave Select/Chip Select) – Line for the master to select which slave to send data to. *In practice, the number of slaves is limited by the load capacitance of the system, which reduces the ability of the master to accurately switch between voltage levels. The clock signal synchronizes the output of data bits from the master to the sampling of bits by the slave. One bit of data is transferred in each clock cycle, so the speed of data transfer is determined by the frequency of the clock signal. SPI communication is always initiated by the master since the master configures and generates the clock signal. Any communication protocol where devices share a clock signal is known as synchronous. SPI is a synchronous communication protocol. There are also asynchronous methods that don’t use a clock signal. For example, in UART communication, both sides are set to a pre-configured baud rate that dictates the speed and timing of data transmission. 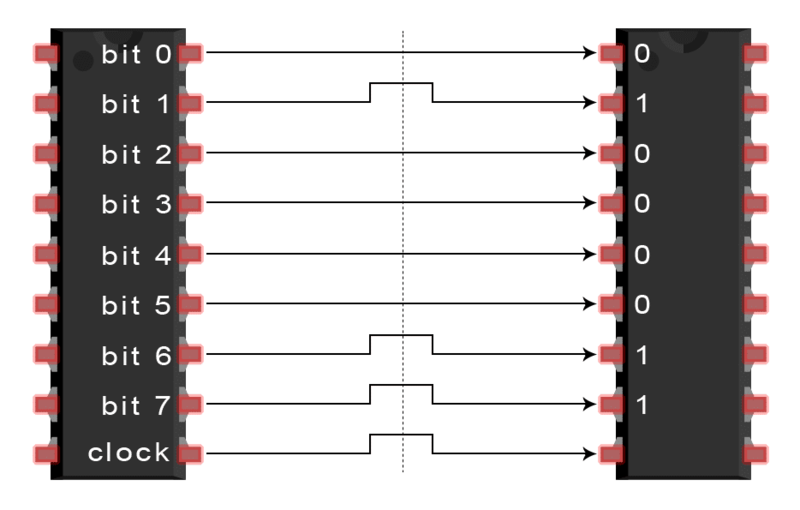 The clock signal in SPI can be modified using the properties of clock polarity and clock phase. These two properties work together to define when the bits are output and when they are sampled. Clock polarity can be set by the master to allow for bits to be output and sampled on either the rising or falling edge of the clock cycle. Clock phase can be set for output and sampling to occur on either the first edge or second edge of the clock cycle, regardless of whether it is rising or falling. The master can choose which slave it wants to talk to by setting the slave’s CS/SS line to a low voltage level. In the idle, non-transmitting state, the slave select line is kept at a high voltage level. Multiple CS/SS pins may be available on the master, which allows for multiple slaves to be wired in parallel. 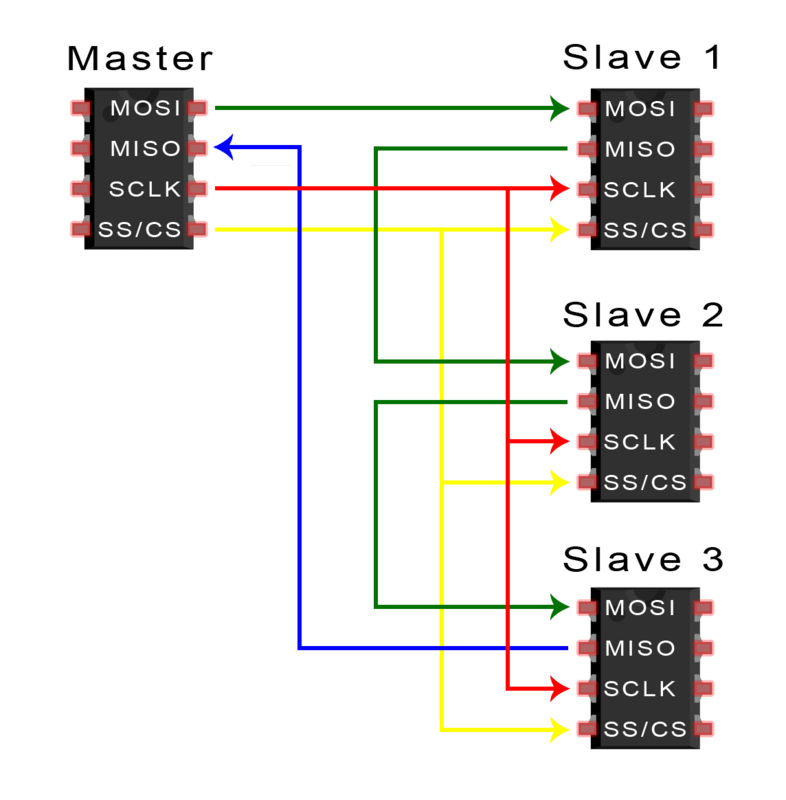 If only one CS/SS pin is present, multiple slaves can be wired to the master by daisy-chaining. The master sends data to the slave bit by bit, in serial through the MOSI line. The slave receives the data sent from the master at the MOSI pin. Data sent from the master to the slave is usually sent with the most significant bit first. The slave can also send data back to the master through the MISO line in serial. The data sent from the slave back to the master is usually sent with the least significant bit first. Hopefully this article has given you a better understanding of SPI. Continue on to part two of this series to learn about UART driven communication, or to part three where we discuss the I2C protocol. If you have any questions, feel free to ask it in the comment section, we’re here to help. And be sure to subscribe, we send out an email each time we publish new tutorials! Very nice and erudite explanation of what could be a confusing technical issue. I especially like the fact you brought up an answer many of us would have with this statement, “With I2C and UART, data is sent in packets”, making clear there is no header data along with encapsulation. Great Job. how do the master know if there is data sent from slave? doesn’t there need to be clock signal sent by slave like master do to be synchronize the returning data? If you r talking about SPI then there is separate line called MISO. On this line slave will send the data. What and when do should send by slave which is mentioned in tje respective device datasheet…. All the cmunication details mentioned in the datasheet of slave device accordingly master need to send the command to slave. Clock is required for every bit which will be generated by master only. or does the clock never stop even there’s no data sending/receiving? Excellent explanation. Easy to understand specially for beginners. Very nicely explained in simple manner. Can somebody please explain how communication happens in daisy chained mode. Good post, in a simple language and terms, where everyone can understand easily. But, i also want to know about the modes of operation in SPI. Have you explained that in a different post? Or can you add it? heuristic process of learning in simple way. Thank u so much for ur simple explanations. how will the slave sense that the master is sending bit 1 or 0? This article is written as an introductory part of communication protocols but there is a lot of comparison with other protocols before introducing to them. Otherwise one of the best i’ve found. Nice and simple! If u will have coding with demo i will soooooooooooooooooo! good.Now itseif that like only having.Thank u soooooooo much. I think the master expects a response from the slave and thus keeps on sending the clock signal (see arrow directions in illustrations) so the slave can timely send data bits back. This leaves the question how the master recognizes that response communication is beginnig as there may be zeroes at the beginning. Maybe response is expected immediately? Hello! Nice article, but i think there is a small mistake in section “Steps of SPI Data Transmission” where step 1 should be step 2, and 2 should be 1 because the clock follows the chip select. What is the maximum distance we can use this communication, minimum to maximum Data speed rate and How many slave we can communicate from master practically. Doesn’t answer why they don’t make MOSI soup. Am I right to assume that the term “slave select” is actually wrong? Looking at the daisy-chaned components my understanding is that communication is only possible to all slaves at once. If not could you explain how one slave can be selected among others in the daisy chain? the only website i have ever seen upto now on which i get the sufficient and better information regarding all communication protocols. Great explanation. Quite simple and easy to understand. Thanks alto. So useful and practical !! Thanks a lot. So useful and practical !! Thanks for this very simple, brief intro. How does the master direct data to a specific slave in a daisy chain configuration? I think a few other people asked with no response. This should be more clear. What is a “significant bit”?